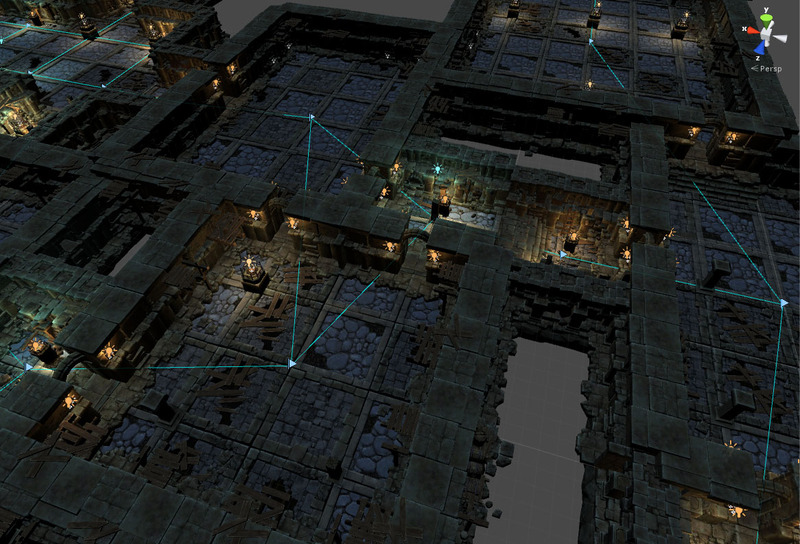 Dungeon Architect is an editor extension that helps streamline your level creation process. It has a intuitive graph based theme designer to interactively design the look and feel of your dungeons. AntoineDesbiens, KevIU, genaray and 23 others like this. This is really cool and Needs more recognition in the Unity Community. MHUnity and Sabathius like this. Love the pictures on the Unreal site. This looks really good and yeah, it deserves more recognition here. Ony, AliAkbar and HeadClot88 like this. i think i saw something like the tiny keep algorithm for the main dungeon generation in the unreal video. Btw can the volume customization (specifically the different themes one) be used during the generation too, or only afterwards manually? It would be cool if you could just set three themes (lab,general interior, courtyard) and have the generator do the work for you according to some params. Cheers, cant wait to see more of it! Hans, Rick-, Shawn67 and 1 other person like this. Looks good! I currently use DunGen. Very curious to see more about this one. Love the video of adjusting the layout visually by dragging the room and adding side routes by marking desired path. Subscribing to thread to keep up to date on news! Does this include a runtime editor, so players can create and modify areas? cbodungen and AliAkbar like this. @hopeful I'll add a runtime editor demo. It should be easy. There's already one for Unreal Engine. cbodungen and hopeful like this. Hans, Rick-, S4G4N and 1 other person like this. I noticed the Unreal one is in C++.. Are you porting to C# for the Unity version? @Shawn67 Yes, I ported it over from C++ to C#. Most of the time went in designing the graph editor UI, which had to be done from scratch. Most of the features are ported over. Hans, Rick-, Licarell and 2 others like this. Your scripts can now respond to various events from the dungeon generator. You might use this to populate your dungeons with game specific objects after the dungeon is built, or perform cleanup before it is rebuilt etc. This example shows how waypoints are scattered throughout the level for the AI agents to patrol. Hans, Shawn67 and S4G4N like this. Voltarrens and theANMATOR2b like this. Hans, moure and S4G4N like this. Are you looking for Beta Testers yet? I would like to participate. AliAkbar, Shawn67 and Licarell like this. and if you do want some help testing it with a wide range of users at different levels then I would love to help out! AliAkbar and S4G4N like this. Sorry guys for the lack of updates. Got caught up with other things last month. I'm working full time on this now. I'd like to thank @S4G4N (3DForge) for offering me his modular assets for free to test Dungeon Architect and it's been very useful. Here's a simple theme I created using @S4G4N's awesome TaD Sewer Kit. I'll be starting a beta program soon and would love to get your feedback. I got a lot of interesting ideas from the UE4 version after users started using it there and will be implementing those here too. Hans, hopeful and Shawn67 like this. Great to see you come back with more to show and even better news that the Tile A Dungeon - Sewer Kit works well with this great tool that you are developing. MangeyD, Shawn67 and AliAkbar like this. What are the advantages to use this over something like DunGen? I haven't used DunGen so I don't know how it compares. Dungeon Architect is designed to be modular and extensible. So, you are not restricted to the algorithms designed by the author. You can swap out the procedural dungeon layout generator with your own without changing a single line of code in the DA module (just drop it in the dungeon game object). This helps you (and me) create new algorithms for DA. You can create dungeons for your 2D games using sprites. The tooling (paint, volumes etc) will work seamlessly. If you don't want to write your own layout builder, you can customize and existing one by writing your own marker emitters. This reduces the barrier to entry as it is very easy to create. Marker emitters are simple scripts that you write and are invoked after the dungeon is build. This gives you an opportunity to inspect the dungeon model and emit your own markers. These markers are later picked up by the theming engine. More info on this later. MangeyD, jasonMcintosh, S4G4N and 2 others like this. This sounds great, I especially like the ability to use 2 themes in the same level. Can't wait to try it out. Really loving the look of this and can't wait for you to start up a beta program. I am pleased to hear that this works well with an off the shelf 3rd party set of assets as other procedural tools I have used have really fallen well short when I have tried to use a custom set of assets with them. Great, also to hear you are back on to this project and I hope we see more soon!! Voltarrens, MangeyD, S4G4N and 1 other person like this. I can just say WOW !!! I won the www.tileadungeon.com domain with more sets on the way. Voltarrens, AliAkbar and MangeyD like this. MangeyD and S4G4N like this. I purchased Dungen because my project will use multiple procedural generated dungeons. I love your graph based editor and how easy / user friendly it looks. Since I am also using lot of 3DForge stuff like interiors I am really looking forward to see your asset in action. Good, fast runtime generation is important for me. And of course an user friendly and easy to use asset. Hans, MangeyD, Mana-Station and 2 others like this. Hans, MangeyD, Mana-Station and 1 other person like this. These new screenshots are amazing!! WOW, that looks great! I’ve never seen my asset used in that way before Really amazed that DA can also make backgrounds. Very handy feature. Voltarrens, Hans, MangeyD and 3 others like this. Mana-Station, S4G4N and hopeful like this. Hans, Shawn67, ephemeral-life and 1 other person like this. Asset Store is much bigger place for you to sell this tool. Good decision; although it'll be pirated as soon you give ppl beta access, you'll still make more return than in UE4's store. I hope it's easy to make big open areas, my combat system won't work on smaller ones. I guess I could just delete some walls after the level is generated though. Can't wait to get my hands on this tool . The pathways are now automatically painted with another texture, if you specify it. There are also options on how much space it should take. The pathways are now automatically painted with another texture, if you specify it. How to make the 3D Tiles ? What conventions must we follow to have them working and snapping perfectly with your tool ? Is there some tutorial dealing with using our custom meshes and collision or showing the guidelines ?